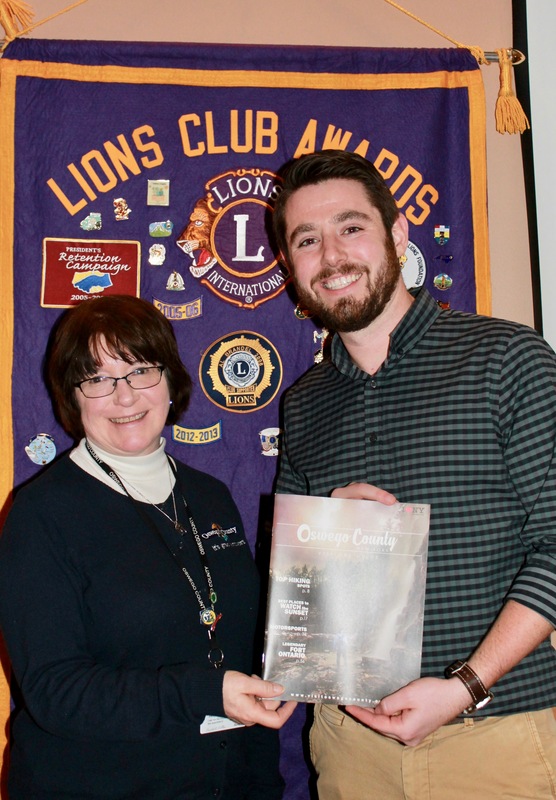 Janet West Clerkin, tourism and public information coordinator for Oswego County Community Development Tourism and Planning, was the featured speaker at the Fulton Lions Club’s March meeting. Clerkin gave an overview of the positive economic impacts of tourism, the many ways visitors enjoy activities in the county, and her office’s role in the county’s public information management. Clerkin, above, is thanked by Fulton Lions President Zachary Merry for her presentation. The Fulton Lions Club, chartered in 1953, is also known for their Lions Loot Sweepstakes, Lions Mane Event Comedy Night and Charby’s Duck Derby. The club provides financial assistance for those in need of eyeglasses, eye exams, and hearing aids to residents in the Greater Fulton area. Find them on Facebook under Fulton, NY Lions, or at fultonlionsclub.com.